There's just something about red velvet cake that makes any occasion more festive. 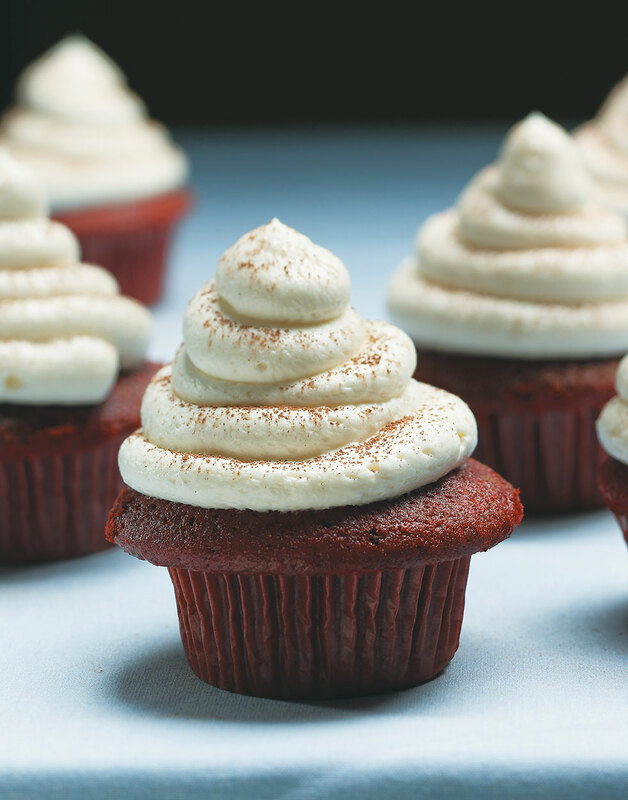 Whip up these perfect Red Velvet Cupcakes and everyone gets their very own cake! Preheat oven to 350°. Line two 12-cup muffin pans with paper liners. Whisk together dry ingredients in a bowl; set aside. Blend sugar and eggs in a bowl with a hand mixer on medium speed until ribbons form, about 5 minutes. With mixer running, add oil in a stream until blended. Mix in food color and vanilla until incorporated. Mix half the dry ingredients into butter mixture, followed by the buttermilk and vinegar, then remaining dry ingredients; blend just until incorporated. Fill liners to the top with batter and bake until a toothpick inserted in centers of cupcakes comes out clean, 20–25 minutes. Cool cupcakes in pan 20 minutes, transfer to a rack to cool completely. Frost with Classic White Icing. With the mixer running, add the oil for the cupcakes in a thin stream so it emulsifies with the sugar and eggs. Prevent overmixing by blending in half the dry ingredients, then the buttermilk and remaining flour mixture.